There is one thing that I am not and that is musically inclined. However, today I wish that I was. Our next review is not based on reading a book, coloring, matching or the improvement of one’s mathematical skills, but rather the sounds that you can make with your mobile device. A short time ago we were introduced to Barrett Productions, a development group that has been producing mobile apps along with many other products since 2007. Recently updated in the App Store is their latest musical creation, Go Go Xylo which is compatible with various Apple devices but does require iOS 5.0 or later. Come play with this virtual xylophone, along with many other instruments in a variety of ways. With every tap of your finger, a well tuned instrument will sing. What’s the point of buying a real xylophone when you can get an amazing one for your Apple device for FREE. Just be sure to download it soon as this price is a limited time offer. Upon entering Go Go Xylo users will immediately notice the brilliant colors and 3D animation that is incorporated. As the conductor of your band, your main screen is equipped with a harp, bells, drums, saxophone, trumpet and of course a xylophone. Let the jam session begin by simply tapping or dragging your fingers across the screen. Yes, I said fingers!! You can play multiple instruments at one time. As the user, if you have a musical ear then you will want to explore the red clef button just under the saxophone. Here users will be able to change the key that instruments will play in (C, D, E, F and so forth) as well as the essential musical relationship between major and minor scales. If confused on how to explore or where to begin, simply click the question mark button as pop up directions will appear. It also includes a brief instructional YouTube video which will require internet access in order to view. If your band of instruments are getting out of hand or too loud, simply click the horns in the upper right hand corner. It is here that users can alter the volume to both the xylophone and the accompaniment. When downloading Go Go Xylo it comes pre-installed with three songs: Baa, Baa, Black Sheep, Blue Danube Waltz, and Old MacDonald. Additional songs can be loaded to your devices library as in-app purchases. 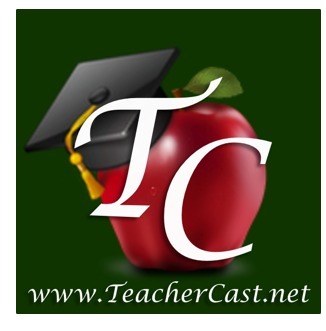 Currently the downloadable library consists of Children and Classical songs. Purchases can be made individually or as a group, ranging from .99¢ to $2.99. After choosing a song, as the conductor your view changes from seeing the entire band to just the sheet music of that song. As the tone deaf reviewer, I was slightly overwhelmed with all the buttons at the top: Mode (easy/hard), Tempo (normal/slow), xylo (on/off), vocals (on/off), and accompaniment (on/off). I was unsure as to what they all did, however, like the free play mode, the question mark just under the sheet music provided a brief tutorial. Once we set our mode to easy and our tempo to slow, it was like playing musical Simon Says. To begin, simply click the play button and notes on the sheet music and the keys on the xylophone will begin to highlight. Listen to the song the whole way through or start and stop it at any time. See what happens if you try playing the song from memory without any support. A note to the developers – although the xylophone does have the lettered notes on each key, might it be possible to include its coordinating musical note as well on the xylophone. This additional notes support could be an available option which is turned on/off based on the users need. Go Go Xylo is a wonderful download for any home or school device. In looking at our district benchmarks, third graders study physical science which relates to sound. The integration of Go Go Xylo could really enhance a variety of classroom environments. Our review is based on exploration with an iPad and by having the large screen and the feeling like you are making music in your lap was incredible. Integrated arts is an essential component to a child’s education. Children shine in many ways and the arts is one of them. Barrett Productions is supporting this cause interactively via your mobile device. If you would like to learn more about Barrett Productions, please visit their website here. Whether you are a musician or not, it’s time to Go Go Xylo and have a little fun. Step outside the box and see how your mobile device can meet the musical side of yourself, child or students. Take advantage of this wonderful FREE offer that Barrett Productions is providing today, simply click here to begin downloading Go Go Xylo. This review is also featured on the Fun Educational Apps site along with many other educational apps. Musically inclined, I am not, but many others are. So Applicable2u felt that it was important to share with other educators and parents the importance of apps that encourage children and yes, even adults, the world of music. About a month ago, Dented Pixel brought to the Apple Store a rare find. An educational app that offers a book like feel with an added twist. It is very simply called Princess Piano and can be played on your iPhone or iPad device. This elegant little princess once lived on Cloud Kingdom. As of late, she is now living among a different world due to the evil witch, Beatrice Dafowl. Thanks to her magical ballet slippers, Princess Piano was unharmed. Although Earth is a wonderful new place to explore, she wants to return to Cloud Kingdom. While exploring this application you will become a musician, learning how to read musical notes as you play on the piano. Let’s pirouette our way into Princess Piano’s world to help her return safely home to Cloud Kingdom. What kind of musician are you? Do you need to take things adagio or slowly? Or are you familiar with musical notes that you can move allegro or more briskly? Regardless of the type of person you are, this application can appeal to many. It has been referred to as a “girls” application, but Applicable2U feels that some boys might be able to get past the beautiful princess and gravitate towards the main idea which is the musical part of the application. If your little one is a sequential, follow the rules kind of child, then you will want to begin with the “play game” option first. Here users will be provided a short story and directions on how to play. As a user succeeds within each stage, Princess Piano will be that much closer to going home. Levels of difficulty are labeled as: Beginner, Advanced and Virtuoso. Within the beginner level a great deal of support will be provided. For example, keys will flash, as well as notes and keys will be labeled, and a 60% or better is required in order to earn rewards. In the Advanced level, keys are still labeled but it is now required that musicians earn an 80% or better in order to move on. While in the Virtuoso level, users must get 90% or better in order to advance. Players will be reinforced with a score card at the completion. As users progress, stars will be earned, thus unlocking things that Princess Piano might need along the way. Such things might include adorable dresses, cute shoes, and sweet accessories. As your collection gets bigger they will be stored in the “dressing room” area. Here users will go from being a musician to a fashionista. Dress Princess Piano however you would like. In Applicable2U’s opinion, Princess Piano is an application that makes many transitions. It tells a brief story or fable, you learn how to read and play music as a way to finish this fable and gain the happy ending that we all love. In addition, it has a puzzle like feel as you explore in the dressing room. Through a users exploration, they will become more familiar with each note, thus allowing them to begin writing their own songs. To do so, it might be time that your little one plays in the “song maker” mode. Here songs can be saved and reloaded for future use. With the option of notes and the ability to change the BPM’s (beats per minute), parents and educators might see a whole new side of their student or child. Not sure if you like what you created, simply click the preview button. Notes can be altered and deleted as you see fit. Who knows your little one might just become the next great song writer. Applicable2U would give this musical application a thumbs up! It is certainly worth the download as it encourages children to love music in a whole new light! Each child shines in a different way when it comes to their education. Some are jocks, others are artists, mathematicians, scientists and yes even musicians. With school budgets in jeopardy, specialty programs like music are usually the first to get cut. Let’s not take away from our children those skills that open different educational opportunities. By downloading Princess Piano to your iTunes library today, you will be supporting the art of music! If you would like to learn more about Dented Pixel, please visit their website here. Come along on a musical adventure with Zizu, an adorable zebra that just happens to be the mascot for the development group, Bubulu Labs. Whether your child loves to bang on just about anything in your kitchen cabinets or happens to have a musical ear, Zizu Cooks Up a Tune might be just what you are looking for. It was recently launched within the App Store at the end of June for the iPad device running an operating system of 3.2 or later. Within our educational system, a number of specialty programs tend to disappear when money is tight. Unfortunately, music happens to be at the top of that list. Applicable2U truly believes that children need different avenues to share and express their feelings and abilities besides the typical academics of math, science and social studies. Of the many things that Bubulu Labs has to offer, you can be certain that your child(ren) will be given the opportunities for “creative play and open-ended exploration that seeks to spark a child’s imagination” as stated in the About section of this application. When playing or cooking it up with Zizu, you can be one of two types of chefs: an apprentice or master chef. A parent or child might find it useful to view the “options pan” before beginning. It is here that users can set whether musical notes are shown and if a baby or magic mode should be turned on or off. Zizu will welcome you into his colorfully animated kitchen of musical appliances. Simply tap on a googly-eyed friend and listen to the sounds it will shout out. Try tapping multiple objects at the same time and see what new sounds you can come up with. As the apprentice chef, the fun doesn’t stop there! Zizu’s kitchen table has been turned into a piano and the black keys on a typical piano now look like loaves of bread. On the refrigerator there is a reminder note which says “Playlist.” Initially an apprentice chef’s playlist will only have two songs: Twinkle, Twinkle and I am a Little Teapot. However, more songs can be added to this playlist for an additional download fee by simply clicking Zizu’s bug friend, the housefly, to see what other choices your little one can cook up. A note to the developers – might it be possible to add an additional lock or parent password protection on adding more songs. With little hands in control of the iPad, Applicable2u is just trying to avoid the unwanted clicking or downloading capabilities. Once the song has been chosen your little ones hand eye coordination will be put to work by following the location of our friendly housefly. Be sure to keep on an eye on him though as he sometimes veers away from the piano. Within the master chef mode, users can now step up their musical talents by recording their own songs. As the master chef, a user may want to explore the “options pan” once again to change the type of experience they will encounter. The only difference now to the kitchen is the red dot in the bottom right hand corner. This button is the recording feature. When pressed, a window will appear asking for a title of the song which will then be saved to the boombox. Depending on your child’s age, a parent might need to provide some support in typing this in. As the master chef, you can now let your imagination run wild. Not only can songs be created with the piano, but users can tap in the sounds of our friends from around the kitchen. When complete, simply tap the pause button and a playback option will be made available. Within a master chef’s playlist, songs can be saved, replayed and deleted. Turn the boombox up and let the movement begin on the dance floor as you rock out to your own creations. Overall, Applicable2U would give Zizu Cooks up a Tune a thumbs up! If you have little ones at home or at school, this application is applicable to you! Whether we are in the grocery store or local mall, my little man loves getting his groove on. It is an application that incorporates kid friendly songs, the ability to learn musical notes, develops ones love for music and also expands a child’s creativity and imagination. If you would like to learn more about Uma Pandit and Bubulu Labs, then visit their website by clicking here. 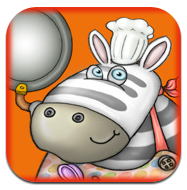 If cooking it up with Zizu is what you are looking for, then click here to download Zizu Cooks up a Tune to your iTunes library today! 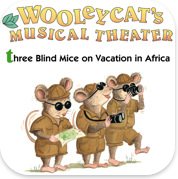 Wooley Cat’s Musical Theatre presents Three Blind Mice on Vacation in Africa. This is one of many recent interactive book applications that Applicable2U has recently downloaded. If you choose to download this application, your little reader will quickly begin to sing along with the story, dance and interact with each of the pages. My exploration of this app began as my son was actually building with Legos. Very quickly he stopped playing with his all-time favorite toy to see what Momma was up too. This application is both a story and a song all in one. Oddly enough, as I “played” with this app, I found myself thinking of the song – Head, Shoulders, Knees and Toes which most children are familiar with. What child wouldn’t want to spend time exploring the musical adventures of three blind mice. If you happen to have an iPad handy, connect it to a projector with the help of a VGA adapter, why not view this story as a whole group. What’s interesting about this book is that as a teacher I can see it being read in two different ways. First, as a whole group, lets close our eyes and put our imagination to work as we listen to this book. Even before the story has begun a catchy little tune begins which will make the reader want to do a little “shake of their shoulder” to the beat of the song. Unlike most interactive books, this particular app indicates that a page should be turned with the sound of a chime. Before moving onto the next page, as the teacher, click various images on the page. Have the students hear the sounds that are made and ask them to make predictions of what it looks like on the page. Students will begin to giggle when they hear the character voices and added effects. Continue with this idea of being blind and making predictions throughout the entire story. You will be amazed at the visions your readers/listeners will make. It is now time for the little blind readers to open their eyes and see the pages, words, and interactivity come to life. The second approach to using this book application in the classroom or at home will allow the users to see the words to this story/song as they are highlighted and guided along each page. Now that the reader can see the pages, this might be a good time for various types of questions from either the teacher or child. For example, why did the mice think the elephants leg was a tree? This book lends nicely to working on the 5 W’s (who, what where, why and how). This time around, have students come up to the iPad and have them interact with the books images. The endless smiles will be priceless. Applicable2U definitely gives Wooley Cat’s Musical Theatre – Three Blind Mice on Vacation in Africa a thumbs up!! Interested in seeing/hearing what stopped my son from playing, then be sure to visit your iTunes library to begin your download or you can see what other books that PicPocket Books has to offer.